Having some trouble with the Hall effect sensor in the picture above. Link is to the website where it tells how to connect. The sensor has a green and red LED. Red when tripped and green when not. Works on both 3.3 and 5v. When I trip the sensor with a magnet, the red LED on the sensor lights up as well as the LED on the Duet WiFi board. But when I trigger M119 in Web Control, none of the axis will show as being tripped, which I do not understand since the LED on the Duet board lights up, saying that an Endstops is tripped. M574 X1 Y1 Z1 S0 for active low. Active high does not work either. Will it not work since I cannot tune the sensor (No pot on board), or could it be a problem with configuration? Maybe I am missing another setting that is messing up on boot? Looked through the configuration, even disconnected my BLTouch to see if that might be the problem, but still no-go. If DC42 would like one for testing, I can mail you one as I have quite a few left over (Being used on my CNC so ordered extras in case of problems). When the sensor is connected to the Duet and triggered, what is the voltage between its output and ground? Perhaps it's low enough to light the led on the Duet but not low enough to register as triggered. What voltage should I be expecting? Not at home, but can check it this afternoon and post here what I get, both at 3.3v and at 5v. When triggered and connected to the Duet it should certainly be below 1V, preferably below 0.8V. @dc42 OK, then I am definitely not getting that. At 5v in, it is sitting at 3.39v output to the signal line, with 1.83v at 3.3v in. If I were to add in a resistor on the sense line to make it drop below .8v, would that be fine or should I just go with a different hall sensor? 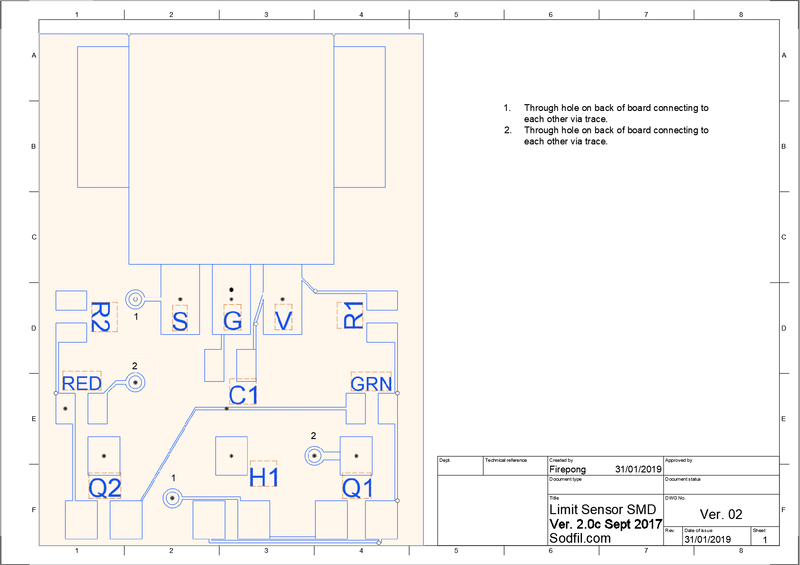 Which Hall sensor are you using? I tried to read it, but the writing on the chip is to small, and I do not have a magnifying glass to tell. Tried to find it on the website where I bought the sensors, but it does not list it anywhere. The sensor, as shown in the link above, is a all-in-one board that I had bought for the CNC, not for the 3D printer. And it does not come with an adjustable pot, as well as no resistors on the Sense line, which is why it is putting out so much voltage. On the CNC board I have, it has trim pots for the endstops, which this sensor is supposed to be used with. Are you sure it outputs low (<1V) when triggered, not low when not triggered? Are you certain that you have connected the 3 wires from it to the Duet correctly? Note, the Vcc (red) wire should go to the middle pin on the Duet endstop connector. That's just the Hall sensor chip on the board. There appear to be 2 transistors on it too. Need a schematic or a specification. Cant find anything on the transistor, but looking over the board as well as using the multimeter on a few of the traces, the transistors are what turns the LED's on and off, depending on the output of the hall sensor. P.S. on the top, it reads 2A6, so if that is going by normal readings, should be a 2A 6V transistor. Also, it is definitely not dropping the voltage enough. With no magnet, it is applying 3.3v to the sense line and with the magnet, it is 1.44v. With a resistor on the output of the sense line, dropping to .6v (Don't have a lower resistor sadly :(), the Duet board sees that the sensor is tripped and shows that the endstop is triggered. So on that note, how low can the voltage go? All the way to 0 or? Can you trace the connection to the output pin on the Hall sensor PCB and see if there is a resistor in series with it? @dc42 There is no resistor on the board at all for the output. When checking resistance from the output to the sense line wire, it comes up as .1ohm (Basically 0), which made me decide to add a resistor on the sensor line itself. Have some on order that should be the right resistance for the sense line. Can you trace the output circuitry, back to one of the transistors? 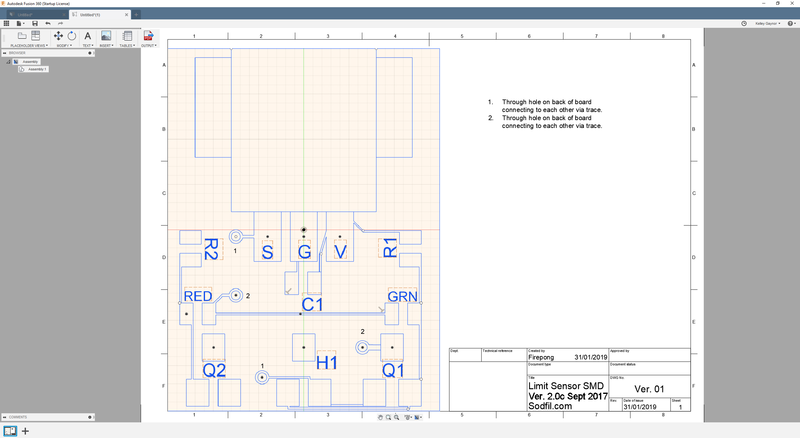 Or get a schematic out of the supplier. Went ahead and traced out the whole board. This is what it looks like, traces and all. One of the R2 pads with no wire, is going to ground. Thanks. Can you tell me what the top pad of Q2 is connected to, and the right pad of Q2? "The limit sensor will output abut 1.4 volts in the tripped state. To accommodate the output needs of the Duet you can use a voltage divider the bring the sensor out voltage to the necessary level." This explains the problem, because 1.4V is out of tolerance for any 3.3V electronics and is marginal even for some 5V electronics. It may be that if you connect a 330R or 470R resistor between output and ground, that will bring the voltage level low enough. Q1 is going to the positive side of the red LED and Q2 is going to ground. The #2 through-hole point is the only connection to the top of Q1, going to the red LED. Thanks. Are you able to read any markings on Q1 and Q2? It looks to me that the Hall sensor is driving the output directly and the transistor are only present to drive the LEDs. Unfortunately, most 3.3V Hall sensors have very low output drive, and are not capable if driving the Duet endstop inputs directly. When I designed a Hall effect endstop board several years ago, I included a buffer to drive both indication LEDs and the 3D printer controller. It needs just one 5-or 6-pin IC to do that, the same size as just one of the transistors on that board.